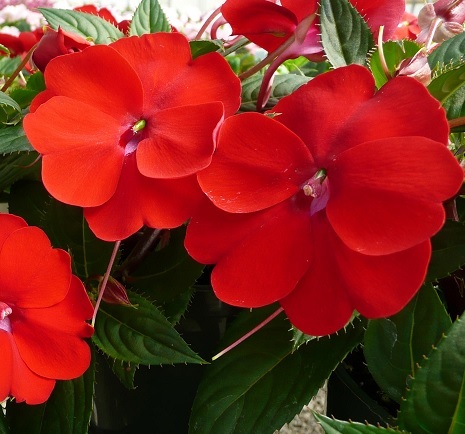 Sunpatiens Red - Brad's Bedding Plants, Inc.
Sunpatiens are revolutionary new hybrid impatiens that thrives in sun and takes the heat. Sunpatiens are the result of an intense breeding program that has spanned many years and has been tested the world over. Strong weather tolerant plants that hold up well to wind and rain while thicker petals and foliage are less prone to disease. Grows 12 to 36 inches tall and wide in the garden. Make sure you have good irrigation, Sunpatiens are Downey Mildew resistant.